Denis Otieno is one of the villagers getting $22 each month from the charity GiveDirectly. He and his wife have used some of the money to buy cypress saplings. They hope to sell the trees for lumber in a few years to pay for their children's education. Young guys in dusty polo shirts. New moms holding their babies. Grandmas in bright head wraps. They&apos;ve all gathered in a clearing for one of the village meetings when something remarkable happens. Practically every person&apos;s cellphone starts tinkling. It&apos;s a text alert from an American charity called GiveDirectly. Last fall, GiveDirectly announced that it will give every adult in this impoverished village in Kenya an extra $22 each month for the next 12 years — with no strings attached. The money is wired to bank accounts linked to each villager&apos;s phone. The alert is the signal that the latest payment has posted. Everyone starts cheering. Some of the younger women break into song. The payouts are part of a grand and unprecedented experiment that is motivated by an equally sweeping question: What if our entire approach to helping the world&apos;s poorest people is fundamentally flawed? Today practically all aid is given as "in-kind" donations — whether that&apos;s food, an asset like a cow, job training or schoolbooks. And this means that, in effect, it&apos;s the providers of aid — governments, donor organizations, even private individuals donating to a charity — who decide what poor people need most. But what if you just gave poor people cash with no strings attached? Let them decide how best to use it? GiveDirectly has actually been advocating for this kind of cash aid for the past decade. Founded by four grad students in economics who wanted to challenge traditional aid, the charity has already given $65 million to people across Kenya, Rwanda and Uganda, provided by a mix of Silicon Valley foundations and ordinary citizens who contribute through GiveDirectly&apos;s website. And GiveDirectly has shown through rigorous, independent study that people don&apos;t waste the money. Still, those cash grants were relatively modest one-time payouts. With this experiment, GiveDirectly wants to see what happens when you give extremely poor people a much longer runway — a guaranteed "basic income" they can count on for years. Michael Faye, the chairman of GiveDirectly, says they&apos;ve chosen to set the payment at $22 because in Kenya $22 per person per month is "the food poverty line — the amount of money it would take to afford a basic basket of food for yourself." This hamlet near Lake Victoria — about 400 residents living on less than $2 a day in mud-brick huts with no running water — is just the beginning. (GiveDirectly has asked that NPR not disclose the name of the village to protect residents&apos; privacy.) 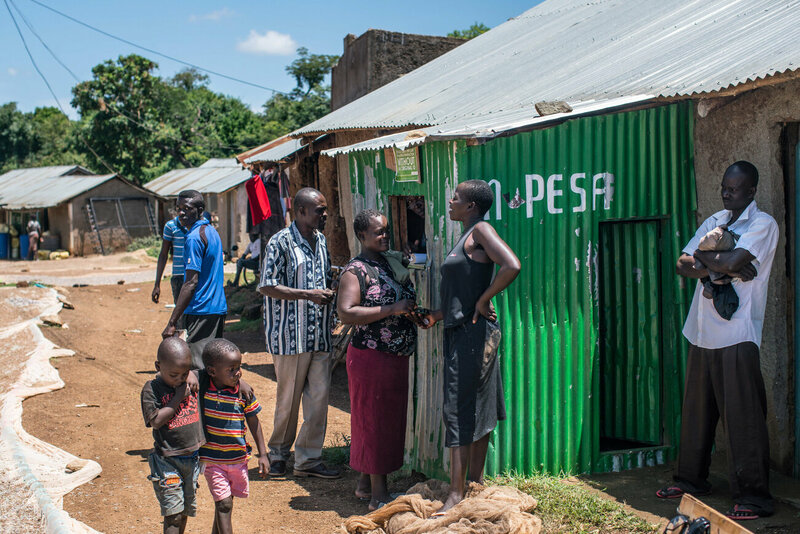 This coming fall, GiveDirectly wants to extend the monthly payments to every adult in 200 similar villages across Kenya, then compare them to 100 "control" villages that don&apos;t get the cash. To do this they need $30 million, of which they&apos;ve raised $25 million. Some of the world&apos;s foremost researchers of anti-poverty strategies will be doing an independent study of the data that emerges — including Alan Krueger, professor of economics at Princeton University, and Abhijit Banerjee, a professor of economics at MIT and director of the Abdul Latif Jameel Poverty Action Lab. It will take more than a decade to determine the impact. But just a few months in you can get a hint from two cousins at the village meeting, who are grinning and clapping as the women finish their song. Denis Otieno is a father of four in his late 30s. He holds up his phone to show his new balance. "I got it!" he exults. Standing next to him is 30-year-old Dancan Odero, who is single and more soft-spoken, but looking just as pleased as he clicks through his phone. "I&apos;m more happy," he mumbles. "I&apos;m more happy. I&apos;m more happy." For each of them the money has already proved life-changing but — and this is the key — in totally different ways. Otieno: "I&apos;m thinking of putting up a forest"
We&apos;ll start with Otieno. I meet up with him one morning in a field by his house as he slashes off tree branches with a machete. He&apos;s going to burn the wood to make charcoal. 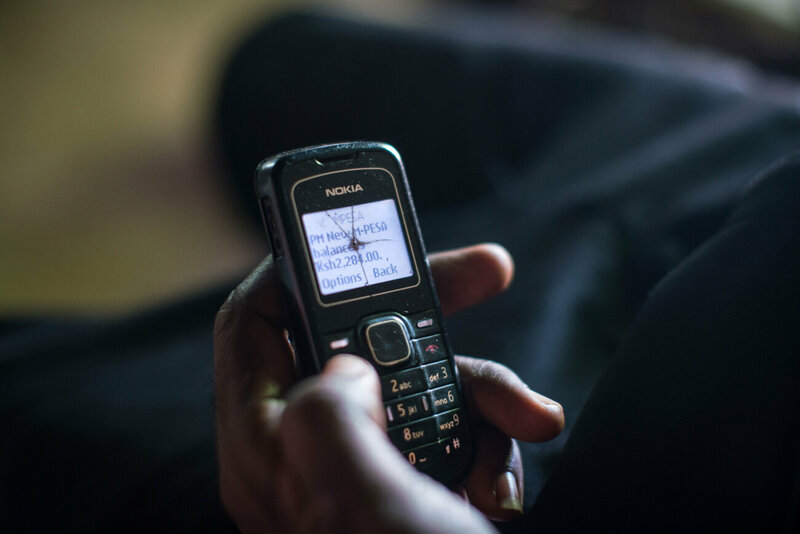 What you need to know about Otieno is that he&apos;s an entrepreneurial sort of guy who all his life has been striving to climb out of poverty — only to find himself blocked by a lack of funds. Despite a tough start in life — he was orphaned at age 16 — straight out of high school he got himself into a training program for mechanics. He managed to land a job repairing cars, thanks to a relative who worked at the same company in one of Kenya&apos;s cities. Then that company closed. Since then, Otieno says, he has found it impossible to find another position. "I&apos;ve applied! I&apos;ve applied so many times and it doesn&apos;t work," he sighs. Part of the problem, he explains, is that the person doing the hiring at a company often requests a bribe. "They&apos;ll say, &apos;OK, I want half your salary, before you start.&apos; " Otieno doesn&apos;t have that kind of money. 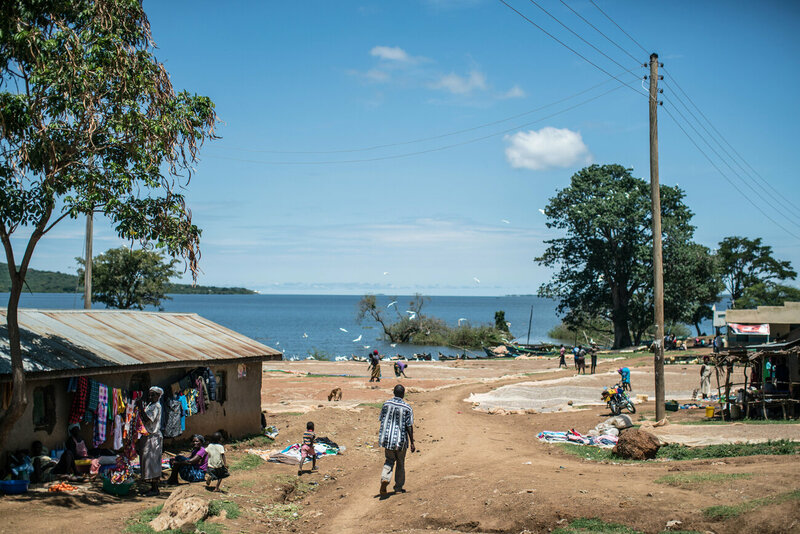 He has also tried starting various small businesses — including a kind of bar, selling drinks to fishermen out of a gazebo on the shore of Lake Victoria. The trouble: To get the bar off the ground, Otieno had to take out a loan of about a thousand dollars at an interest rate of nearly 25 percent. Now the payments are crushing him. 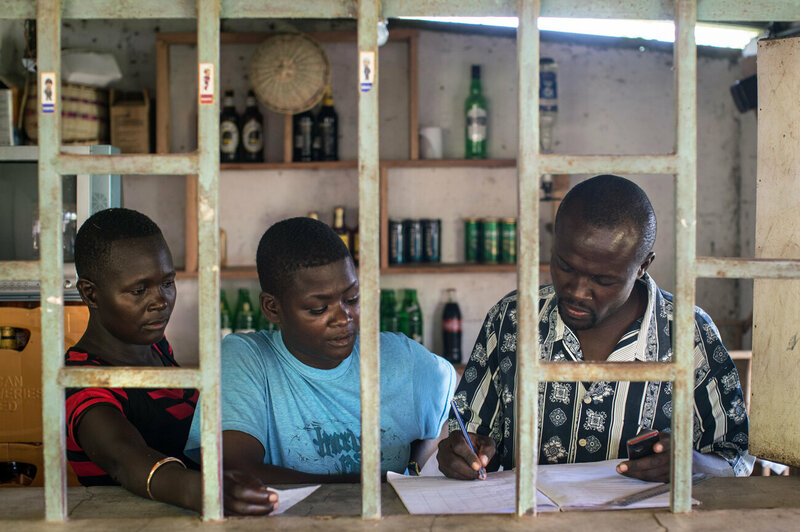 "Each day, whatever sales I make I just send to the bank," Otieno says. "You end up working for the bank." Then there&apos;s this charcoal making. Ideally, Otieno says, he would buy the rights to harvest one of the tall, thick trees that grow on some people&apos;s property, then rent a chainsaw to cut it up. But that would require money up front, which, again, he doesn&apos;t have. Instead, he has to make do with the thinner shrubs on his own land, hacking off each limb by hand. Sweat pours off him as he hoists the pieces onto his shoulder and lugs them over to the burn pile. It will take hours to chop the wood. Then he has to cut leaves to cover the pile. Light a fire at the bottom. Shovel dirt on top. The process will take two days — after which he&apos;ll have enough charcoal to sell for, at best, $5. So the combined $44 a month Otieno and his wife have been getting from GiveDirectly is boosting their income by as much as 50 percent many months. The benefits are already visible, most notably in the case of Otieno&apos;s 2-year-old daughter Gloria, who is looking healthy and full of pep as she toddles behind him. "My Daddy&apos;s girl," he calls her, because she follows him everywhere. She picks up a stick and pretends it&apos;s a machete, thwacking at branches alongside her dad. Gloria used to cry all the time, Otieno says, because she was hungry. Before the GiveDirectly payments started there were many days each month when he couldn&apos;t afford to buy his children breakfast or lunch. Sometimes there wasn&apos;t even dinner apart from what Otieno calls "porridge" — water mixed with flour and sugar, "just to fill the stomach." On those nights, he recalled, "you feel so ashamed as a father." He still wishes he could feed his children more meat and fish. But with the extra charity money, now he can at least guarantee them solid food for both lunch and dinner. And for breakfast they&apos;re getting milk from several goats that are chomping on shrubbery nearby. The family used to own just two. With the charity money they&apos;ve bought three more. They hope to breed them — then sell the offspring. Maybe upgrade to a cow. Longer term Otieno has an even more ambitious plan: "I&apos;m thinking of putting up a forest," he says. Specifically, a grove of eucalyptus and cypress trees. They&apos;re used as lumber in construction. 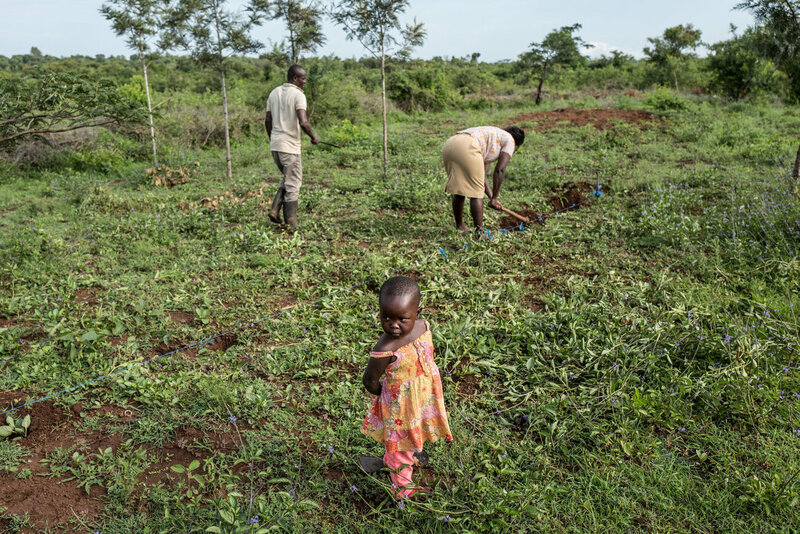 Every month Otieno has been setting aside $10 of the charity money to save up for saplings. They should be tall enough to sell in five years. He wants to use the money to put all four of his children through high school. He&apos;ll designate a different section of the grove for each child to help him tend. "It&apos;s going to be like their bank account," he says, laughing. And maybe something more. Otieno is hoping this venture will be the one that finally boosts his family out of poverty. Because this time, for the first time, Otieno doesn&apos;t just have an idea. He has the capital to make a proper go of it. So that 12 years from now when the money from GiveDirectly stops flowing, he won&apos;t need it. Now to Otieno&apos;s cousin, Dancan Odero — the 30-year-old single guy. He&apos;s had a different experience. Odero lives just a 10-minute walk away from his cousin&apos;s house along a red dirt path. When I catch up with him he&apos;s also hacking at branches. The field belongs to his elderly aunt. He&apos;s clearing underbrush while he chats with her. She looks worried. Odero has epilepsy. Working in this sun is risky. "I&apos;m scared he could have a seizure right here," she confides in a low voice. She&apos;s seen it happen before, she adds. "Many times." But Odero insisted on helping. His family says he&apos;s constantly trying to prove he can be useful — be independent. But people hesitate to hire him for even odd jobs. He&apos;ll go out with the other young guys to look for work. Then watch as everyone gets picked but him. Back at his house he says that when that happens, "it makes me so frustrated I start shaking and I feel like crying. But I just keep it inside." What makes it all worse, he adds, is that he didn&apos;t used to be this way. Back in elementary school he was a top student. One of his cousins, Isaac Oguti, remembers how Odero even used to get a little cheeky with teachers, bombarding them with questions. But Oguti says they&apos;d let it slide because "he was so bright, the teachers loved him." Then, when Odero was in the eighth grade, the seizures started. By the end of the year he had to drop out. He&apos;s clearly still intelligent. He loves to read. And he speaks English at a remarkably high level for someone who had to stop studying in middle school. But his family says over the years the attacks seem to have taken a toll on his brain. His speech has become slow and halting. And he often falls into a sort of fog, becoming confused about what&apos;s going on around him. With no real income, he&apos;s had to rely on his mother and siblings to pay for practically everything, including food and medicine. His oldest sister Betty says he so hates having to keep asking for money that there were times he wouldn&apos;t even tell them he was out of epilepsy drugs. They would just notice that his seizures were becoming more frequent. "Then we&apos;d realize, &apos;Argh! 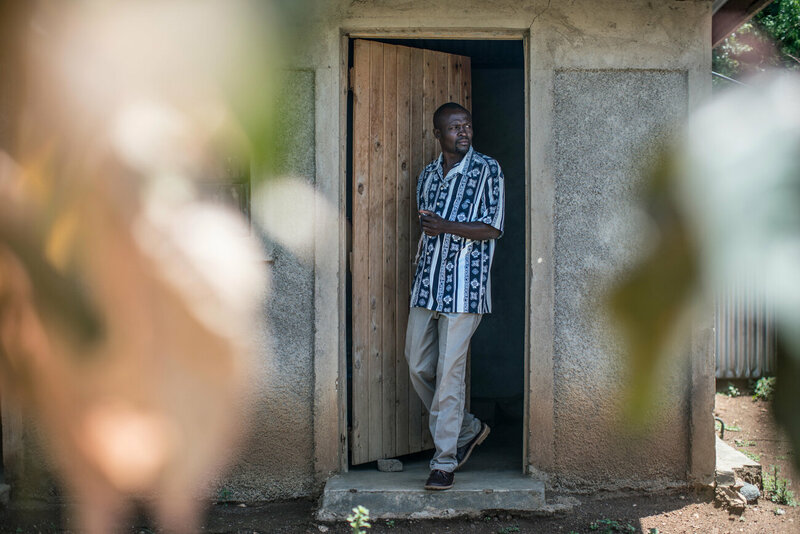 he&apos;s got no medicine.&apos; "
But these days, Odero says, he can use the new GiveDirectly money to buy his meds. He takes them out, handling them very carefully. They eat up a third of his monthly payment. Still, he&apos;s had enough cash left over to save up for something just as precious to him: a sofa and two armchairs. He explains that in the village, when a guy reaches adulthood, it&apos;s traditional for him to build himself a house on his parents&apos; land — a mud hut with a living area and sleeping nook. But Odero never had the money. It wasn&apos;t until a year ago that his brothers built a hut for him. Even then he had no furniture. Buying that sofa set was so important he says, "so that when guests came to visit I wouldn&apos;t be ashamed." His mother, Pamela, remembers the afternoon when a little white taxi with the new sofa set strapped on top pulled up to Odero&apos;s hut. He carried in one of the armchairs and just sank into it, she says, laughing. Then, she says, he started calling over all his friends, saying "Come! Come have a seat!" "Yes," he agrees. "I couldn&apos;t stop smiling." There was a hitch, though: It turned out the set only consisted of the wood frame. Cushions for the seat and backrest must be purchased separately, and there wasn&apos;t enough money to cover that. So since then, Odero has been carefully husbanding his GiveDirectly payouts to complete the set, buying one or two cushions each month. As for any planning beyond that? There&apos;s not much, he admits. Unlike his cousin Denis Otieno, Odero has no scheme for how to use the charity income to make more money. No strategy for the day the money will stop coming. I ask him, "Do you worry that at that point you will be back to where you were before?" "Yes," he says, casting his eyes downward. "I think I might." So would this make GiveDirectly&apos;s grand experiment a failure? Faye, the charity&apos;s chairman, says not necessarily. "There&apos;s a lot of talk about this magic bullet that you can apply once and people will no longer be poor," he says. "I think we all hope that to be true. We would obviously hope cash has the long-term impact." But he points out that this is an unfair standard. Every month that GiveDirectly provides the villagers with $22 the charity is, by definition, lifting them out of extreme poverty. So on some level, it&apos;s just a different version of the billions in relief aid that the world currently spends annually to provide desperately poor people with food and other forms of in-kind help. No one expects that type of aid to permanently lift people out of poverty. So it would be enough for this experiment to show that just giving poor people cash is more efficient and effective. "Let them make the choices," says Faye. "Because the poor are pretty good at making them." Only they can know the damage that poverty does to each individual. And it&apos;s not just the tangible deprivations. For Odero, what poverty really stole from him was his dignity. And the couch set is what has given it back. He no longer feels like the village invalid, the guy who always has to depend on everyone else, who can&apos;t ever be the host. Now he can invite people over — and offer them a place to sit. "I feel like now I can be counted as a person," he says. And even practical, go-getter Otieno says the most profound benefits go beyond the material. It&apos;s late afternoon. Otieno and his wife, Bentah, are sitting in their hut — heads bent over a notepad as they calculate their budget for the month. Otieno tallies some figures with a pencil, then looks up and says, "I was thinking that since last time we weren&apos;t able to give your mother any grain, we should get her some this time." Bentah purses her lips. "Hmm, how much do we have?" Both of them say a conversation like this would have been out of the question before the GiveDirectly payments started. Otieno worried Bentah wouldn&apos;t agree with how he was spending their earnings. As the eldest of four siblings, and with his parents long dead, he felt a duty to help his younger brothers and sister with a little cash during tough times, even when he and Bentah were just as hard up. And Otieno felt all the more awkward about it because he has yet to pay Bentah&apos;s parents the traditional dowry a groom owes his in-laws — generally two or three cows, a goat and some cash. The in-laws let the marriage go forward on the understanding that Otieno was good for the dowry down the line. But as the years have passed it&apos;s become an unspoken point of contention. For her part, Bentah says she would often put unrealistic demands on Otieno. "We would have our needs as a family, and honestly he wouldn&apos;t have enough for it. But I would sometimes fail to understand that and that would bring friction." So Otieno kept the family finances to himself — doling out pocket money to Bentah so she could buy the groceries but keeping her in the dark about the bigger picture. "I would be like, &apos;OK wife, do your work. I&apos;m the man. Let me do my part. I&apos;ll just bring the money and here&apos;s what you should do with it.&apos; "
And the silence over money seeped into the rest of their relationship, says Otieno. "I would come home. If there was a meal, I&apos;d eat the meal. Then go to bed. No talk." Yes, agrees Bentah. "It was a little bit gloomy." But now, figuring out how to spend the charity windfall has become a hopeful, joint project. Adding up their budget has become a monthly ritual. And it&apos;s got them doing other fun stuff together. Going on shopping excursions to the market. And, says Otieno, strolling around the village, hand-in-hand. "It&apos;s not normal in our village for couples to walk this way," he adds, grinning a little sheepishly. "But it&apos;s like we&apos;re married the other day." "You mean like newlyweds?" I ask. "Yes," he says, laughing. "You&apos;re right." Was there ever a time in your life when just a little no-strings cash would have made — or did make — a huge difference? Use the tool below to tell us your story. We may feature it on NPR.